Which one will become their faith, Ninja Konoha or Akatsuki? That question always come to my mind. If you read Naruto Manga till the last update, you must be know that Sasuke has became Akatsuki member. 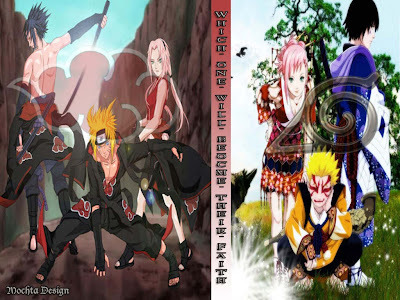 As we know Naruto and Sakura have strong bond with him, I'm worried if they can't take Sasuke's back to Konoha and being hopeless, Naruto and Sakura will joined also with Akatsuki for get back their memories when they still together as team 7. Imposibble? Yes if we see that possibility from manga's or anime's view, because Naruto is the main player. But all can be possible if we took this problem on the real life, just thingking if your close friend, suddenly joined wrong organisation and invite you to become the next member on (his/her) organisation. Only two choice answer in front of you. First, denied and try to make (him/her) realize with (his/her) fault, but the risk your bond could be broken. Second, receive (him/her) invite, so your bond with (him/her) will be fine. But my opinion about them on this wallpaper, nor becoming Ninja Konoha or Akatsuki, Naruto, Sasuke and Sakura always look great and cool. As team, I believe their power would be so awesome. I wish they could stay together again. I don't care they would become as Ninja Konoha or even Akatsuki on the future, I always like them as team.